I came across a very interesting piece in “End This Depression Now!” by Paul Krugman where he lays out why the belief that investors will dump a country’s bonds if they lose confidence in that country’s monetary and/or fiscal policies, is untrue. According to the theory fear of budget deficits are driven (primarily) by an attack from so-called “bond vigilantes”. As a result pro-austerity forces demand dramatic reduction in state spending in order to stave off this threat. At first glance the idea seems reasonable, if people don’t think a country is doing a good job they won’t want to invest in it. However, as Krugman explains, this is not the case. He suggests that borrowing should be even greater, “since at the moment U.S. borrowing costs are very low”. (We’re referring to long-term interest rates here.) When one factors in inflation the rate is actually negative. The way it works out is investors are “paying the U.S. government a fee to keep their wealth safe”. The data actually shows that the market isn’t just okay right now; they see it as being okay for a while to come. The irony here is that those conservatives and Libertarians who call for spending cuts right now are actually saying that the market is wrong, which traditionally is a heresy reserved for liberals and communists. It would seem strange to watch them demand something to satisfy the market when it can be clearly seen that the market doesn’t agree with them. Krugman notes that those upticks were all reversed leading to an all time low borrowing cost at the beginning of 2012. 1. The Wall Street Journal runs an editorial titled “The Bond Vigilantes: The Disciplinarians of U.S. Policy Return,” predicting that interest rates will go way up unless deficits are reduced. 2. President Obama tells Fox News that we might have a double-dip recession if we keep adding to debt. 3. Morgan Stanley predicts that deficits will drive ten-year rates up to 5.5 percent by the end of 2010. 4. The Wall Street Journal – this time in the news section, not on the editorial page – runs a story titled “Debt Fears Send Rates Up.” It presents no evidence showing that fear of debt, as opposed to hopes for recovery, were responsible for the modest rise in rates. 5. Bill Gross of the bond fund Pimco warns that U.S. interest rates are being held down only by Federal Reserve bond purchases, and predicts a spike in rates when the program of bond purchases ends in June 2011. 6. Standard & Poor’s downgrades the U.S. government taking away its AAA rating. 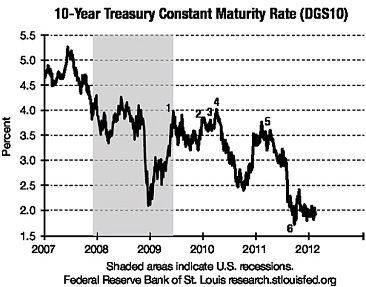 The result was by the end of 2011 U.S. borrowing costs were lower than ever. So we have a good question here, why do they continually insist that public spending be cut? Well if it’s the financial elite they have a very god reason: The profit motive. When these services are eliminated from federal spending they can take the hole left behind and fill it with private companies. In addition this justifies paying fewer taxes. It should be no surprise that those in the financial elite would publish something like this to carry out their interests. Did Paul Krugman Admit Exploitation?